Subj: Re: Looks like I'll be comin' to see you next Friday! meeting on Friday with the website guys! I look forward to seeing you again... should be fun! I tried to go and look at the test web site, but it was loading REALLY slowly, so I think I'll wait until I can get down to Mirage and use the high speed Internet line there. I have a few comments about some of the art sent recently. Most of it (TCRI security control room, Interior TCRI security control room reverse, revised exterior end of alley with TCRI building, TCRI guards, interior TCRI large lab with large fluid filled sacks, interior organic interior/reverse angle/wide shot from ledge to view cavern, Utrom with exoskeleton (with version 2 of Utrom as noted below), Technician with skin peeling off, hover husk, interior decontamination chamber, and Mr. Mortu) looks fine. 1.) I prefer Version 2 of the Utrom (with lips and mouth). 2.) I appreciate the facts that you have kept that "crystalline outline" style for the dematerialization effect, but I was wondering if instead of breaking up into "clumps" of crystals, the crystalline shapes actually sort of UNWOUND -- so that as the basic shape of the Turtle's body begins to break up, it actually breaks up into a spiraling vortex of components which resemble (but which don't necessarily have to be EXACTLY like) the outlined drawn shapes in the Turtle's body. The only reason I suggest this is that I have seen the "clumpy" disintegration effect in a couple of movies recently, and thought something a bit more unusual might be good. However, if we can't figure out a good way to accomplish what I am suggesting here OR it turns out to be not a great idea, I would accept what has been submitted. 3.) The one interior design for the TCRI building that I'm not really crazy about is the transmat chamber, for a couple of reasons. First -- and most important -- I would really like to see the transmat platform and the machinery immediately surrounding it more closely resemble the stuff from the original comic book. If you have a copy of the first printing of issue #4, that cover has an excellent view of this hardware. (I'll attach an annotated scan of that cover to this email.) Just to be clear -- I'd like the design of the transmat for the show to include the key components which I have circled on the cover scan, but extra stuff, if needed, is fine (as long as it looks right, of course). The second thing is those curved bladed shapes around the top of the transmat hardware -- they look a LOT like the blades on the Shredder's armor, which I think is not appropriate. 4.) As promised, also attached is my idea for a TCRI patch logo design. lock picture by tomorrow night! And our main title sequence is scheduled to arrive this Wed! Big doings in ShellTown to be sure! I've watched the tape of episode 2 several times, and REALLY like it... even more than the first episode! It's got me real eager to see more episodes -- I think this serial thing is really going to pay off big time. There are some REALLY cool touches, like the distorted shadows on the sewer wall as the Turtles run by in one scene, and the reflection of Don and Splinter in the disassembled Mouser's head. Of course there are also a couple of things that I have to mention as my critical self kicks in. I'm not sure if Gary talked to you about this, but one thing we both noticed right away is that those mask colors in the intro are still wrong (these are those close-ups of eyes in masks which slide into frame, two from the right and two from the left). Is this going to be fixed before the first episode airs? Hope so. The major thing which has got me a little worried, and maybe you can say something that will easily allay my fears, is the issue of April's outfit. When you were up here for our meeting last week, I remember you saying some stuff about how slavishly the animators in Korea follow the model sheets and storyboards, which occasionally results in weird/undesirable things happening. Well, as I watched April in her lab coat and belly shirt (a combination which was okay but looked a BIT odd), I began to wonder if we were seeing the beginning of another situation where -- even though I know we talked about this, and agreed that she should wear different clothes sometimes -- April would be seen wearing the exact same thing in episode after episode. I don't recall seeing any model sheets showing April in different outfits... were there any done? I know we all don't want to repeat the horrible Fred Wolf-era mistake of keeping April in one set of clothes forever (boring! ), so I was wondering what ideas you have for solving that problem. Obviously some of the episodes are far enough along in the animation production line that if April is wearing the same pants/sneakers/belly shirt getup in them, it's too late to change . On the other hand, might we attempt to change this situation in some of the shows which are NOT that far along? (Assuming the problem that I am talking about actually does exist, of course.) What would it take -- supplying a specific new model sheet of April in a different outfit (or outfits) for each episode in which we decide she should have changed her clothes? I think that some careful attention to this might result in benefits such as making the show more appealing to girls (who pick up on that kind of thing right away) as well as opening up a greater possibility of doing April fashion doll-style toys (Barbie scale). I talked with my daughter about this, and she has some interest in possibly sketching out what she thinks might be some different cool outfits for April, if you think that would be helpful. Come to think of it, although it's clearly most important where April is concerned, it might not be a bad idea if we kept this idea in mind for all of our major human characters, especially Casey. Trio: I think their basic colors are fine, and I could probably live with them as is, but I wonder if we could do some kind of small color thing which would biind them together, visually, in a somewhat odd and subtly disconcerting way. 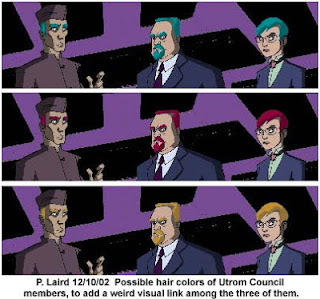 My first suggestion is to give them all the same hair color, and make it a somewhat odd color. I've done a tweak of the hair color to show you what I mean, but I'll attach it to a second email to avoid any compression problems. animatic session until 1pm. If we miss each other, try my cel phone. Exo-suit views - atotal of 13 designs). Lemme know whatcha think! Glad you got that email -- AOL was acting up earlier and I wasn't sure it got to you. I looked over the art that was faxed to me today -- 5 models for the booby-trapped "Gauntlet Hall," 6 new Guardians, 2 Baxter Stockman Exo-suit views -- and it's all fine. Subj: Re: First TMNT Footage! scenes, which you should receive tomorrow! followed by 2 minutes of cool pencil test scenes! turtles' show music tracks as well as a rough 1st draft of show 26! Send me any and all notes asap and we'll turn this puppy around! moment... but I'm still on it! Re: Episode 26 first draft -- I think this may the first "first draft" script to be really close to final approval as is. I have very few comments. 1.) Pg. 17: "Rappelling" is spelled incorrectly... but anyway, what Don and Mike actually do in this scene isn't really rappelling, I think. In the following paragraph, I thought it might be funny to add to Mike's lines about the "giant stomach: "... I don't even wanna think about what "down there" entrails... uh... I mean entails!" But then again, I like puns. 2.) Pg. 18: There's an "alright" on this page. Gack! 3.) Pg. 24: "Don whips out his blades..." I thinks the writer means "bo staff". 4.) Pg. 27: Instead of "We can do more harm than good", I think Leo should say "We might do more harm than good". 5.) Pg. 23: In his notes, Gary said he didn't care for the bit where the female Utrom covers herself up with her tentacles. I see his point, but for me it stays JUST this side of silly without sliding over into stupid, and I like the weird humor of it (it's kind of like Don with the pigeon puppet...). 6.) Pp. 28-30: Gary also makes a good point about the Utroms firing their energy weapons around their own machinery. I think it would be a good idea to have one of them say "Use only stun settings!" 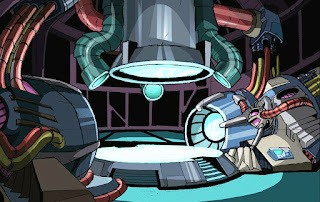 or something like that, and have the actions of the Turtles, including perhaps one of them getting partially stunned while swinging overhead and dropping onto a console, cause the damage which results in the machinery of the transmat going haywire. If we did want the Utroms weapons to cause some overloads or whatever, we could even add to the Utrom's line and have him say something like "Aim carefully -- even stun blasts could damage the organic parts of the delicate translocation matrix!" 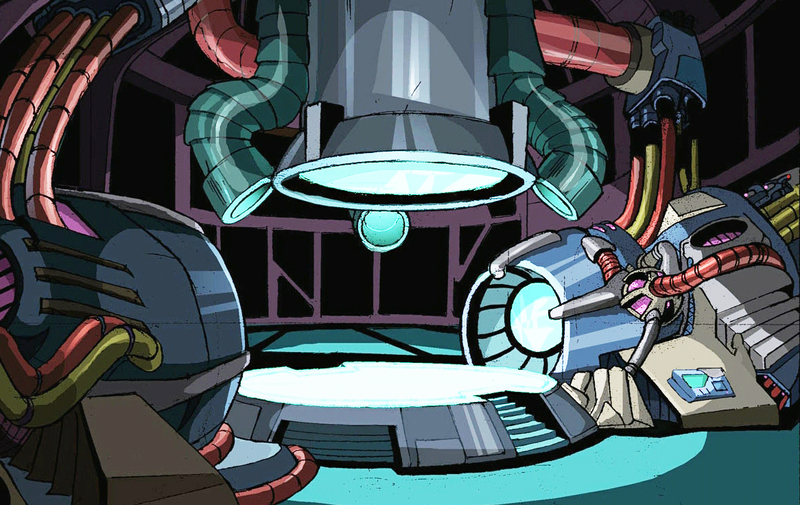 Also, if I'm reading this correctly, the transmat seems to be in the same room as where the Turtles find Splinter in his holding tank. This is not right, I think. In the comic, we had the Turtles find Splinter, then get surprised by the Utroms, then beat feet down a corridor until they came to another room which was the transmat chamber. It just doesn't make sense to me that the Utroms would put both things in the same room. I listened to the music tracks and don't have much to say, except that they sound cool. I think Gary might have some more specific comments. They DO make me want to actually SEE these shows even more, though! Just wanted to let you know that I read the final draft of the script for episode 26 and it's just peachy! By the way, I really like the animation bits you sent, and want to see MORE! I showed it to my brother Bruce (major TMNT fan) and he wanted to see it over and over. Can't wait to see a whole episode. It leads to a short clip which may or may not make its way into the TMNT documentary. Isaac and his crew taped it in my office at Mirage Studios in Northampton, and it's basically me talking about Graphix Duo-Shade (the special paper Kevin Eastman and I used when we drew the first bunch of issues of the original TMNT comic books), and -- in penciling, inking and then toning a drawing of Donatello -- giving a demonstration of how it works. That was a fun afternoon, hanging out with a nice group of people.